As part of our examination of consumer psychology and social media, we previously discussed why people like and unlike brands on Facebook. A clear understanding of this intricate relationship will provide marketers with critical insight for developing a psychological approach to social media marketing. This approach to social media marketing is centered around the idea of brand loyalty and love. You Seinfeld lovers out there will remember Nina, the great conversationalist. So engaging was Nina, that never an opportunity presented itself for…other things. Similarly, social media offers brands an ever-present open line of communication with consumers. Brands are oftentimes so engrossed in this conversation and mistakenly assume their social presence is solely based on their point of reference. The truth is that thousands of followers participate in daily conversations which make up a brand’s overall social presence. There are a few brands out there that constantly rank at the top for the “most loved” brands on Facebook. Before we go on, we should explain that “love” on social media platforms is measured by sentiment analysis agencies. These agencies are able to extract valuable knowledge from social interaction and understand how consumers feel and what they believe. Business intelligence departments rely on this type of technology to understand their audiences and solve complex challenges across the broad marketing spectrum. So what brands go beyond having followers “Like” them and getting them to “Like Like” them? Starbucks is regularly given high marks in this regards. A common response to this finding is “Well of course they are, they spend tons of money on social media marketing.” Well, true, but so do hundreds of other brands. 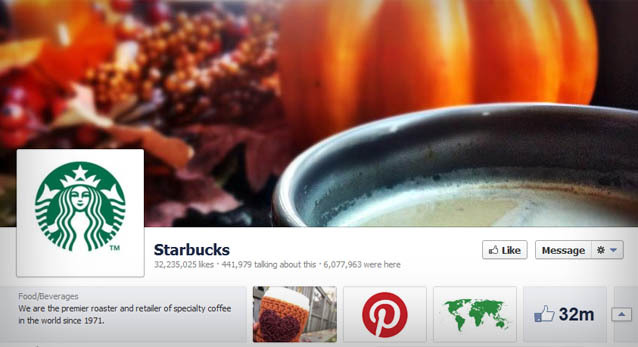 What makes the Starbucks social media strategy successful? We love finding ways to serve you better. Like giving you a little more time to enjoy your coffee or making your life a little easier. And with our free apps, we’ve managed to do just that. 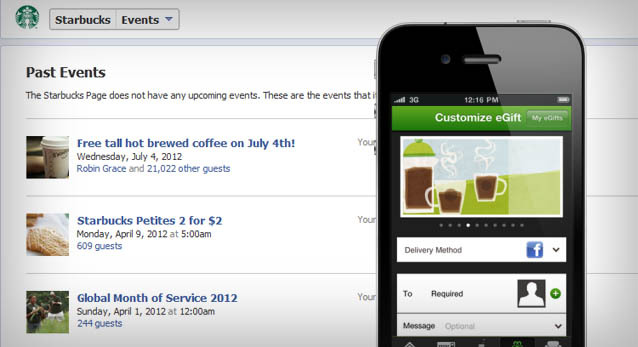 Additionally, users of the Starbucks mobile app can send an eGift to a friend by posting it on their Facebook wall. By fostering online social engagement with the brand at each opportunity, Starbucks is “training” people all over the world to help them recruit new followers. People inherently have a need for interpersonal belonging and acceptance. Early on in life this sense of belonging is fostered by our immediate family. As we get older, we connect with larger social groups like clubs, professional organizations, sports teams, etc. This attribute is now being extended to brands as companies are now transforming their brand advocates into virtual “tribes” who carry and promote their brand messaging everywhere they go. As a branding company, we regularly engage in conversations with clients who are passionate about their brands. Often the challenge is to communicate that passion and create a social environment that stimulates a sense of “belonging.” Even a basic examination of the language used by someone who “loves” Starbucks, or “loves” their Apple products or Nike shoes will reveal that brand is more than just a choice to them. These brand advocates feel a true connection and have a significant sense of loyalty which leads to years of repeat buying behavior.